Most of the penguin species lay two egss, although emperor and king penguins only have one. This is quite logical considering the fact that they breed their egg and hold their chick against a bare "brood patch" on the feet, keeping it warm under a feathery fold of skin. This place would be to small for two eggs. African and little penguins can even have three eggs, when it is a good season (much food). In the beginning the eggs are white: is the underground earth or loam (not ice) or lays the nest in a colony with many birds, therefore many excrements too, very soon the eggs become dirty. The size of the eggs depends on the species. Emperors have eggs which are about 11 cm, whilst those from fairy penguins measure only 3 cm. The egg of the emperor seems large, but when you consider it in proportion to their body-size, it is probable the smallest existing bird egg. Possible reason : the extreme temperatures where emperor penguins breed. Emperors namely start breeding during the Antarctic winter, with temperatures of about - 40°C and in complete darkness. Both partners walk more than 100 km over the ice to reach their colony on the shelf-ice, where the ice will not melt during the next summer. After a few weeks of engagement and courting, the female lays one single egg and passes it directly on to the male, who puts it against the "brood patch" on the feet. Then the female leaves the colony and returns back to sea. Scientists presume that the female would not have enough energy left for returning to sea (more than 100 km back) when the egg would be bigger. 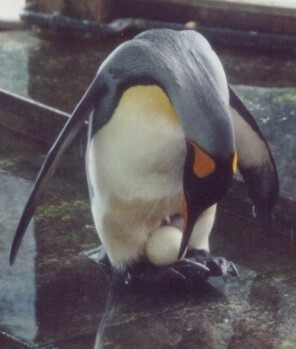 To survive, the male can still walk around a bit with the egg on his feet. Emperors depend from each other for keeping warm. They stand very close together in a circle, constantly turning around, so each bird in turn has the chance to warm up in the centre and has to bare the cold and snow-storms on the outside. In that way the whole group can survive in such extreme climate and raise their chick. When you take a closer look at the eggs of the crested penguins, you will notice that they have different sizes. The first led, smaller egg is most of the time neglected and even when it hatches, the chick will not survive easily. The second, bigger egg is led a few days later and has the better chance to survive. When feeding, this chick will be fed first and only when some food is left over, the other will get some.